We are posting this just in case it takes you by surprise by its sudden return on Tuesday evening. It’s been a long break and you probably can’t even remember who is in your team, never mind whether or not you were doing well in it! Either way it’s time to make amends and get back on the the wagon. We felt it right to also give a reminder of the nuances too. The first being that there are essentially 4 ‘match days’ within this single round; Tuesday 12th, Wednesday 13th, Tuesday 19th and Wednesday 20th. You can switch your subs in and your captain around ahead of each one, until you land on what you feel is an acceptable sticking point. Tuesday (12th Feb) at 8pm UK time. 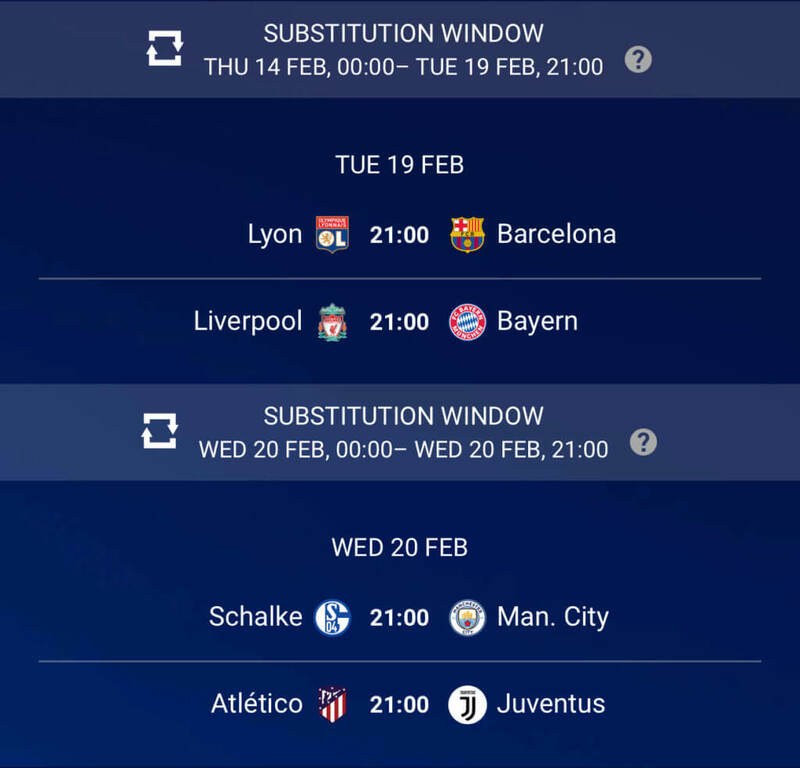 Set your team and make sure you have the players who play on Tuesday in your starting 11. Make sure your (first!) captain plays on Tuesday too, you can switch him and your Wednesday players in later if needs be. And likewise next week too. Wednesday (13th Feb) at 8pm UK time. Yes, there are multiple deasdlines, four in this particular in fact. The 2nd is prior to the next ‘match day’, as they like to call it. The purpose is that you get to switch your aforementioned players in for anyone who hasn’t performed on Tuesday. And most importantly you can select a new captain if your Tuesday guy did a ‘Sane’. The 3RD & 4th DEADLINES! The 3rd is next Tuesday the 4th is on Wednesday. It’s the same principal throughout; make sure your early players are in your 11 and that these later guys are ready to be called into action. Prior to the ‘Round of 16’ (this one!) everyone gets a Wildcard; so yes, you can select a new squad now and start afresh. You also get an increased budget of £105m and in this round you can now select 4 players from each team, rather than the standard 3. 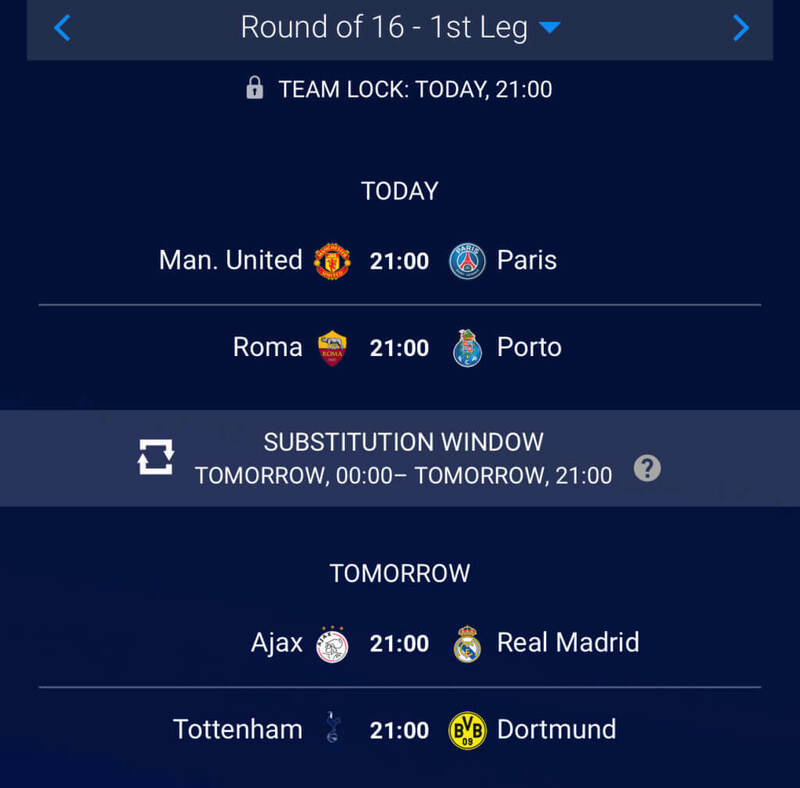 You get 3 free transfers before the 2nd legs of this round begin. That’s in a couple of weeks, not before Wednesday, or indeed next Tuesday, before anyone asks / gets confused! This is looking as competitive as ever and it’s good to see a a few familiar names in the current top 10. We’ve tried to keep it as much to ourselves as possible so that it is mainly ‘Regulars’ from here but some tool did tweet it out from the site handle so there a few unknown participants! 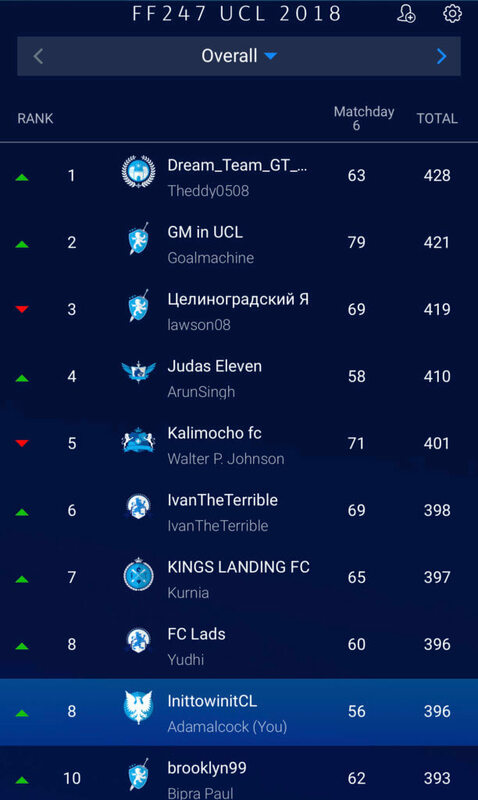 Thanks for reading Fantasy Champions League The Last 16 2018/19. Isn’t he like 45 yrs old? When’s the last time he played let alone up front! Marcelo will be playing up top before too long. I’m on Dzeko at the moment, hes at home. I prefer the guy with a shite load more talent. Dzeko for me, stand out captain this evening I feel. Ok that’s final because my battery is just about out! This is me! Got lured by Alves playing upfront last minute. Took Guerreiro out so let’s hope it doenst come back to haunt me! Good luck everyone! Same here dmc. Looks good! As expected, last 10 minutes wanted to change something, the site crashed and team rolled back to yesterday night’s team – very strange. I have 2 non-starters, but anyway its for fun…so accepting the glitches with pinch of salt. Think we’ve been playing it for about 8 years now and it’s always been the same. Bit pathetic really when you consider who it’s backed by. It’s literally change down the back of a UEFA delegates sofa to upgrade to a suitable server. We’ve also had that same login issue for 2 weeks now and they still haven’t bothered to fix it.